Crows have divided Europe between them. Western Europe is the realm of the soot-black carrion crow, while the eastern half of the continent is home to the hooded crow, with its grayish black plumage. The boundary between the two populations—or more precisely, the hybrid zone where the two meet—is only 20 to 50 km wide, and in Germany, it essentially follows the course of the River Elbe. This is the only stretch of territory in which both of these species are found and successfully mate with each other. The plumage of the fertile offspring of these pairings is intermediate in color between those of their parents. The sharp demarcation between the two populations, however, clearly indicates that gene flow across the hybrid zone is restricted, which implies that hybrids are at a selective disadvantage. 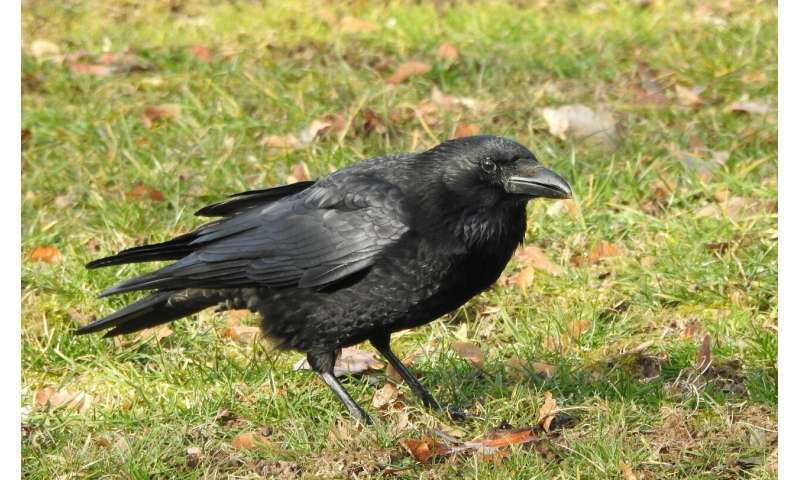 "Defining speciation as the buildup of reproductive isolation, carrion crows and hooded crows are in the process of speciation," says LMU evolutionary biologist Jochen Wolf. He and his research team have now analyzed the genetic basis for the division of European crows into two populations. Indeed, the results of the study demonstrate that the old saying "birds of a feather flock together" really does apply in this instance: The only genes that differ significantly between the two variants are those involved in determining the color of the plumage. This suggests that each form preferentially mates with partners of the same color as themselves. The new findings appear in the journal Nature Ecology and Evolution. In order to identify these mechanisms, Wolf and his colleagues first sequenced the genomes of both carrion crows and hooded crows. "We found that the genomes of both forms are almost identical, and that the few genetic loci that differentiate gray from black crows are likely to be involved in determining the color of their plumage," Wolf says. "We have now carried out a more detailed analysis and determined the degree of genetic mixing between the two populations. Using a technique known as admixture mapping, we pinned down the genetic basis of their divergence." To do so, his team examined the variant loci in the genomes of more than 400 birds—from within the hybrid zone and from the regions in which one or other of the two forms is endemic. In this way, it was possible to identify the genes responsible for the difference in coloration between hooded and carrion crows. "The distinction can largely be explained by variation in just two genetic factors. In addition, we showed that these two loci interact with each other," Wolf explains. In other words, these two factors together determine the color of the plumage. Further analyses confirmed that the rest of the genome can be freely exchanged between the two populations—and is common to carrion crows in Western Europe and the hooded crows in the eastern half of the continent. "Only two major effect genes which together encode the feather color differ sharply on either side of the hybrid zone—the gray alleles are not found to the west of the zone and the black allele is absent in the eastern region," says Wolf. "That's a very strong indication that there is rigorous selection on the basis of color." According to the authors of the study, these findings convincingly show that the hybrid zone along the Elbe represents an example of early-stage speciation followed upon secondary contact between the two emerging species. The classical biological definition of species, which is based on the concept of reproductive isolation, i.e. on the premise that the hybrid offspring of crosses between 'true' species are sterile, obviously does not apply in this case. Nevertheless, gene flow is locally restricted in the genome, because each form preferentially mates with individuals of the same color. This means that hybrids with an intermediate color are less likely to reproduce. But the two populations are not yet fully isolated genetically from each other, since hybridization still occurs. "We are now using a mathematical model to work out the level of hybridization in the hybrid zone as it now stands," says Wolf. "The initial indications suggest that it is very low, on the order of a few percentage points." There are also hooded crow populations in Ireland and in the Highlands and west coast of Scotland. I've seen the occasional hybrid, here in Scotland.